I wanted to let you know that I met recently with representatives from St. Ambrose Housing Aid Center, which owns the historic Aigburth Vale mansion. Through a refinancing estimated to close in December 2016, St. Ambrose will become the sole owner and complete a recapitalization of the project to include moderate renovations and upgrades. The renovation work will include updating the apartments, and upgrading the roof, the heating and air conditioning system, boiler and parking lot. Solar panels will be added, and there will be upgrades to common areas and exterior porches. Since the property is fully occupied, the owner will use an in-place rehabilitation approach to complete the renovation work. There will be no relocation of residents. The project should be finished by the end of 2017. I am delighted that this historic mansion, home to 70 seniors in Towson, will be rehabilitated in a manner that preserves the charm and beauty of this distinctive landmark. Located at 212 Aigburth Road near Towson High School, Aigburth Vale, an affordable senior housing community, is one of the most historic and recognizable structures in Towson. 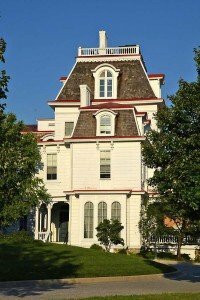 It was designed in 1868 as a country home for the actor John E. Owens.